Favorites from 8 innkeepers of notable Bed & Breakfasts across the U.S.
Walnut Street Books, 9781947597006, 224pp. Take eight innkeepers who’ve served more than 200,000 breakfasts to happy guests—and offered them at least a half-million cookies! These are the 8 Broads in the Kitchen—innkeepers of notable bed and breakfasts scattered across the country. Each one prepares sustainable local foods with creativity and flair, always accenting flavor and freshness. “We are committed to cooking locally,” they say. “We each highlight our regional specialties, offering eggs from happy chickens, pork from humanely-raised pigs, fruit grown right next door, and fresh herbs from our own gardens.” Try these matchless 150 recipes from the 8 Broads, including Blueberry Sour Cream Pancakes with Lemon Sauce, Caramelized Onion Omelets, Parmesan Heirloom Cherry Tomatoes, and Apricot Chocolate Crumb Squares. Each recipe includes Prep Time and Cooking Time—along with easy-to-follow, step-by-step instructions and full-color photography. 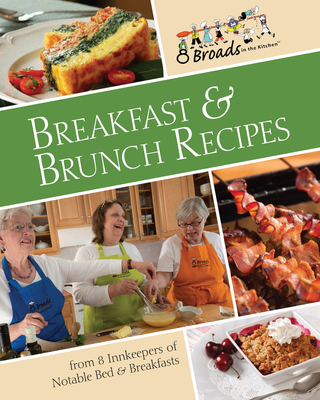 8 Broads in the Kitchen is the trademarked name of a group of 8 outstanding Innkeepers from Notable Bed & Breakfasts from across the country. The eight women are long-time friends and they share recipes, write a blog, have monthly phone visits, and get together whenever they can. The recipes in this book come from these eight women.